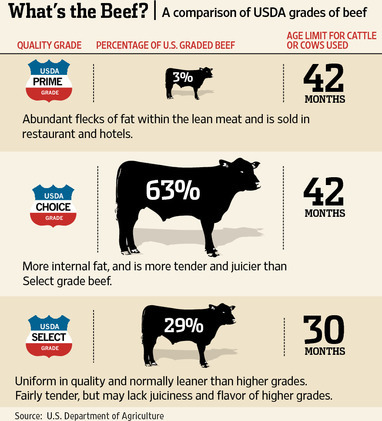 There are eight beef quality grades in the United States. The grades are based on two main criteria: the degree of marbling (intramuscular fat) in the beef, and the maturity (estimated age of the animal at slaughter). Most beef offered for sale in supermarkets is graded US Choice or Select. US Prime beef is sold to hotels and upscale restaurants, and usually marketed as such. Beef that would rate as US Standard or less is almost never offered for grading. U.S. Prime – Highest in quality and intramuscular fat, limited supply. Currently, about 2.9% of carcasses grade as Prime. U.S. Choice – High quality, widely available in foodservice industry and retail markets. Choice carcasses are 53.7% of the fed cattle total. The difference between Choice and Prime is largely due to the fat content in the beef. Prime typically has a higher fat content (more and well distributed intramuscular "marbling") than Choice. U.S. Select (formerly Good) – lowest grade commonly sold at retail, acceptable quality, but is less juicy and tender due to leanness. U.S. Standard – Lower quality, yet economical, lacking marbling. U.S. Commercial – Low quality, lacking tenderness, produced from older animals. Utility, Cutter, and Canner grade are rarely used in food service operations and primarily used by processors and canners.